Rozella tagged me and I'll be joining her to hop on the Magic Carpet and spread the luck around with her! 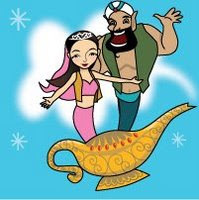 Now I would like to pass on this Magic Lamp of Luck to Lianny, Molly, Nightwing, Osindak and Liza. Do spread the Good Luck and Goodwill!! aik.. how come you're not in the master list? did you make sure you informed GP that you joined the tag so you can be included in the master list? I don't get it..how to inform GP and who's GP? Babe you go to the Master List that Mariuca mentioned in the comment. Then you exchange the links. Copy and paste that one and delete the one on your post. That way the people who take the tag from you get your link in the list as well. I know you're very busy with the new semester :-D anyway, will drop by your new blog soon. Ok, I'll try to get it done asap. Helloooo...It's alright my dear!!! hahaha..
thanks monica! i really appreciate it, but i'm afraid i won't be able to do it at this time. i have so much work, i hope you understand. i hope you're enjoying the weekend dear. aha, no wonder la...hope you're feeling better now.. I have started a list like this on my blog, except it's just for Blogger users. You should join us!